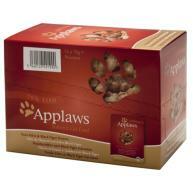 ROYAL CANIN Digest Sensitive Care In Gravy Adult Wet Cat Food is both scrummy and nutritious! 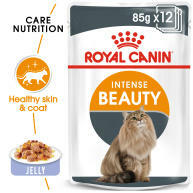 ROYAL CANIN Digest Sensitive in Gravy provides a diet that is highly digestible for cats that are sometimes have sensitive stomachs, it also contains specially selected nutrients that help to reduce your cat’s faecal odour. 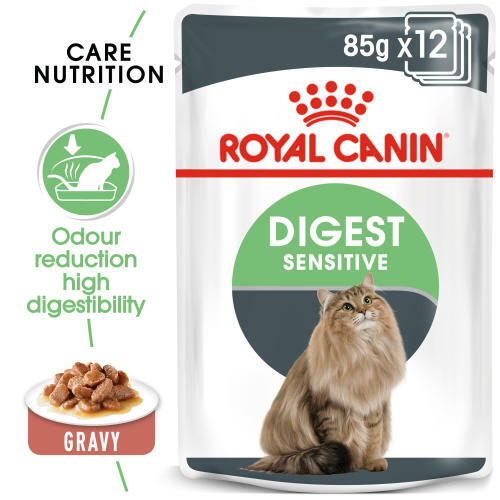 The high rate of digestibility provided by ROYAL CANIN Digest Sensitive in Gravy will ensure that your cat receives more of the nutrients it needs. The low fat content in this diet can also contribute to maintaining an ideal, healthy weight. The protein included is at an optimal level to support muscle and bone strength whilst still maintaining digestive health in your cat’s sensitive tummy. It will also ensure that when your cat does its business, the odour won’t be distractingly strong – which in itself is a sign of good digestive health. This diet also helps support a health urinary traction through an optimal, reduced concentration of minerals. To cater to each cat’s individual preferences, ROYAL CANIN Digest Sensitive is also available as dry food, with crunchy and tasty kibble. If you’re considering mixed feeding, simply follow our feeding guidelines to ensure your cat gets an accurate amount of both wet and dry food for optimal benefit. Odour reduction high digestibility - Highly digestible and helps reduce faecal odour. 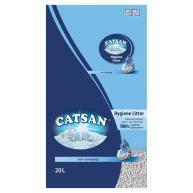 Maintains ideal weight - Helps maintain ideal weight. Additives: Vitamin D3: 200 IU, E1 (Iron): 3.6mg, E2 (Iodine): 0.35mg, E4 (Copper): 2.8mg, E5 (Manganese): 1mg, E6 (Zinc): 11mg. Composition: Meat and animal derivatives, cereals, derivatives of vegetable origin, minerals, vegetable protein extracts, various sugars. Crude ash: 1.7%. Crude fibre: 0.6%. Crude oil fats: 4%. Moisture: 80.5%. Protein: 9.5%.